We are looking for a motivated junior salesman to strengthen our existing sale team. Please get in touch if you are interested. Riko UK Now on Facebook! Riko UK has been trading for over 30 years and during this time we have built up a wealth of knowledge in the supply of machinery for Forestry, Firewood Processing & Production, Woodland Maintenance, Conservation, Grounds Care, Estate Maintenance, Small Holdings & Agriculture. Our range of Alpine tractors include Antonio Carraro and AGT (Agromehanika), both of which are ideally suited to working on steep ground and difficult terrain. Some people refer to these as All Terrain Tractors, Hillside Tractors or even Quad Tractors or ATV Tractors as they often have equal size wheels like a Quad Bike or ATV. 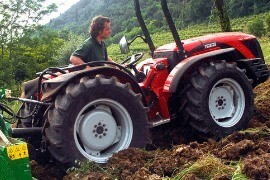 Riko UK Created the brand name, 'Alpine Tractors' to enhance people's understanding of the concept of the tractor. In fact, our brand name 'Alpine Tractors' has been so successful that it has become the generic term used by the media and even our competitor's tractors! All our product range encompasses a vast range of machinery, all designed to make working on land and the maintenance of land easier. We now have Alpine Tractors working with the National Trust, National Parks, numerous wildlife and conservation groups, golf courses, hill farms in Wales and Scotland, fruit farms, hop farms and even english vineyards. The range of Forestry machinery includes forestry tractors, forwarding trailers from 1,500Kg up to 16,000Kg capacity, forestry cranes from 3 meters up to 8.2 meters reach and the unique Riko UK Fast Tow Forwarding Trailer, the only 3500Kg Road Trailer on the market that is designed to take a crane and features our unique Hydraulic Sliding Load Bed. This ensures you achieve the correct axle loadings and tow hitch weight. There are also timber grabs with rotators for excavators, skid steer loaders, telescopic loaders and tractor loaders. 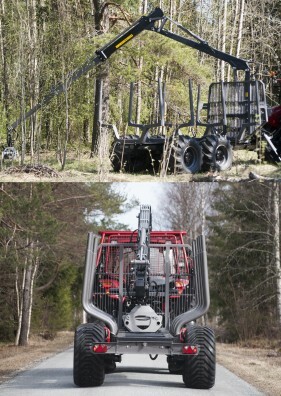 A range of Skidding Grapples for compact tractors up to full forestry tractors. Single drum forestry winches with manual or radio remote hydraulic control; Gear driven drum winches with manual or radio remote hydraulic control. Forestry mulching flails and stump grinders. For small woodland owners and conservation work we produce a range of small scale forestry trailers and cranes for use behind quad tractors and ATV's as well as the smaller alpine tractors. UK timber and arboriculture or tree surgeon waste is unlike the rest of Europe, our wood is full of knots and harder to process. 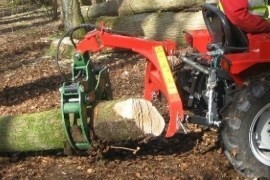 Our range of firewood machinery is carefully selected to be suitable for the type of timber we have in the UK. 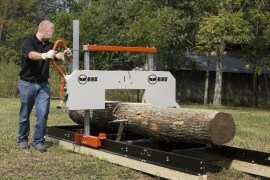 Riko Firewood Processors can be powered by electric motors, petrol engine, tractor PTO, or combination of any of these. 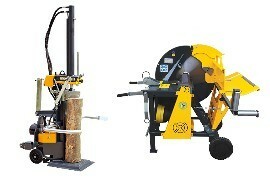 Riko UK have one of the largest choice of log splitters with models ranging between 5 - 50 tons. Riko UK offer both vertical and horizontal electric and petrol driven log splitters suitable to bear weight between 5 - 25 tons. Riko UK also offer tractor hydraulic and tractor PTO driven log splitters ranging from 5 - 50 tons. 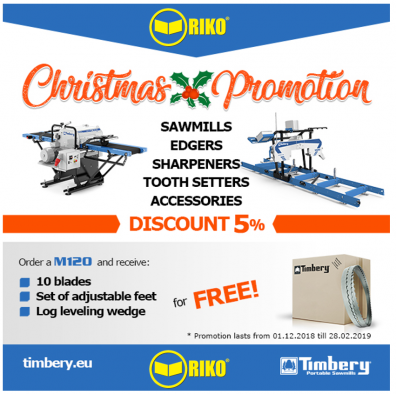 Riko UK produce fully road towable log splitters, processors and saw benches, all with full IVA approval. We can even build special log splitters to suit individual requirements. We have a range of cone splitters for cranes, excavators, skid steer loaders, telescopic loaders and tractor loaders; Plus a further range of saw benches, band saws and log saws with or without conveyors and stand-alone conveyors. Our range of alpine tractors include ANTONIO CARRARO, the world's leading manufacturer of equal wheel tractors and AGT Tractors, made by AGROMEHANIKA in Slovenia. Both the Antonio Carraro and Agromehanika tractor range includes articulated tractors, front steering tractors as well as bi-directional tractors with reversible driving position with hydrostatic transmission. 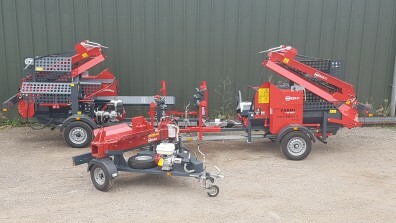 Riko UK is also the sole importer for ECOTECH bank mowers, flail mowers and strimmers, as well as MGM Lampacrescia motor mowers and two-wheel tractors,(pedestrian tractors) cultivators and rotovators. From our unique range of bank mowers and strimmers to our expansive selectino of sickle bar mowers and two wheel tractors with more than fifty attachments you will definitely find a solution that suits you. Our comprehensive range of equipment and implements are all carefully selected to match the application, whether it's a large garden, vegetable plot, farm, large estate or amenity area. Riko UK can provide you with the right equipment for all your tasks. The people at Riko UK are experts in the field and we take pride in finding the right solution for our clients. We are always willing to adapt and tailor our products to precisely suit your needs. Riko UK offers versatile and affordable products to suit all agricultural work.